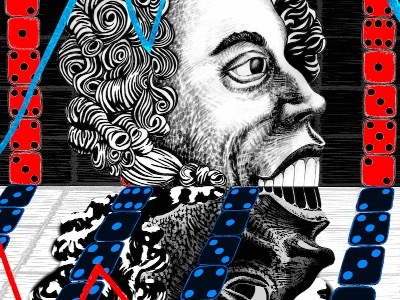 Matt Herzfeld’s new play, The Improbable Fall, Rise & Fall Of John Law (part 1) is an epic tale of early modern finance that spans decades and continents, and features a cast of some of 18th century Europe’s most famous (and controversial) movers and shakers. At its center is John Law, whom historians have alternately described as a financial genius or a treacherous con-man. The play, which takes the form of a bawdy and irreverent historical comedy, follows John from his early days as a notorious London gambler forced into exile by a duel gone wrong through his greatest insight – the invention of paper currency – to his reign as France’s minister of finance, where he oversaw one of history’s first boom-and-bust cycles in a stunning display of incompetence that both rivals recent Wall Street panics and sheds light on the frightening and darkly comic resemblances between our modern financial system and the rigged tavern games of chance where John Law gained and lost his first fortune. A diverse 8-actor ensemble will play more than 33 characters, bringing the turbulent world of John Law vibrantly to life with healthy doses of wit, absurdity and inventive theatricality. Matt Herzfeld (Playwright) grew up in Shaker Heights, Ohio. After an early interest in film, he drifted over to playwriting, eventually graduating with an MFA from the New School for Drama, where he was a recipient of the Ted Snowdon Playwriting Fellowship. He has had readings and workshops with Dobama Theatre, Cleveland Public Theatre, The Actors Company Theatre, Ugly Rhino Productions, Naked Angels, and Wide Eyed Productions. Matt’s other plays include Material For Malcolm Porter (Staged Reading, newTACTics Festival), Crown Heights, Beardsley’s Mentor (Semi-Finalist, National Playwrights Conference at the Eugene O’Neill Center), and What We Lost (produced at The Muse Brooklyn). Matt wrote the screenplay for the short film Isolation, an official selection of the Chicago REEL Shorts Film Festival and the Phoenix Film Festival. Matt also co-hosts a bi-monthly variety show, ‘Peculiar Streams.’ He is a member of the Dramatists Guild. His work can be read on the New Play Exchange (https://newplayexchange.org) and at http://www.mattherzfeld.com. The Dreamscape Theatre‘s mission is to produce ensemble-based productions that tell epic stories on a human scale. Dreamscape crafts productions that call upon the audience’s imaginations so that the special effects happen within their hearts and minds rather than in front of their eyes. Since its foundation in 2003, The Dreamscape Theatre has collaborated with over 150 artists and produced 18 full productions (including 6 world premieres) and 14 staged readings and/or workshop productions in New York City. Significant world premieres presented by Dreamscape include The Burning Cities Project at FringeNYC 2006 (“a phenomenal tour-de-force” wrote blogger Aaron Riccio), Whale Song Or Learning To Live With Mobyphobia by Claire Kiechel (directed by Brad Raimondo) at FringeNYC 2011 (“moving and artful… the perfect meeting of script and direction” writes NYTheatre.com) and the WWI Christmas Truce drama In Fields Where They Lay by Ricardo Pérez González in 2009 (“Gripping drama… smart and effective direction… a first-rate cast” wrote the NY Times).